Along with the C2, C1-01 and C1-02, Nokia today announced their new Bicycle Charger Kit. As the name suggests, this is an accessory which is attached to a bicycle allowing the rider to charge their Nokia device as they cycle. The kit is able to charge devices (with a Nokia 2mm charging hole) when the user is cycling at speeds above 6km/h, and once the user is cycling at 12km/h, Nokia claims the kit becomes as efficient as their standard wall charger (the AC-3). 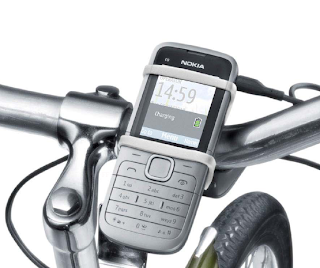 The Nokia Bicycle Charger Kit will be available in India, China and selected markets in Europe, MEA and SEAP by the end of 2010.